Owing to the drift in trend of using adhesives instead of fasteners and welding processes, the adhesives market is anticipated to have major growth rates in the years to come. The demand for adhesives is increasing by the day because of the introduction of bio-based adhesives due to green revolution. These eco-friendly adhesives can also be used underwater thus, increasing the demand to face an upward trend. This demand for adhesives is likely to rise in the coming years owing to the introduction of various kinds of adhesives for different purposes and its acceptance all over the world. The choice of adhesives over mechanical assembling is much better and cost effective. Apart from that it also provides safety in applications like LED chip encapsulation, Circuit board housing, battery cells, cable connections and wire harness. It also provides a protective seal when applied on the surface of the object by not letting the process of oxidization to take place. With screwing, welding, riveting, and other such assembly methods, attachment was only limited to likewise materials like glass-to-glass, metal-to-metal and plastic-to-plastic but with the application of adhesives, the range of bonding substances has widened and now one may use a glass-to-metal or plastic-to rubber widely. Adhesives do not produce any deformation or damage in the substance or material and improves the aesthetics of the product with no corrosion or noise or vibration. Adhesives are now being used in vehicle and aircraft manufacturing as well. Since the orthodox methods like screwing and welding are no longer being used, the adhesive market is anticipated to be boosted up in the coming years. Nowadays, fuel consumption is important and light weight vehicles are preferred, manufacturers are focusing more on using adhesives unlike welding, which would rather increase the weight of the vehicle. The global adhesive market is presumed to be worth US$55.8 bn within the forecast period of 2017 to 2025 with a CAGR of 5.62%. On the basis of application, the global adhesive market is segmented into consumer, footwear and leather, automobile, construction, rigid, flexible and packaging. Based on type segmentation, the global adhesive market is classified into hot melt, solvent based and water based. Based on segmentation by product, the adhesives market is categorized into EVA, epoxy, rubber, polyester, poly vinyl acetate (PVA), acrylic and polyurethane. Among these, the demand for acrylic adhesive is higher as compared to the others because acrylic adhesive can fix wood, glass, metal and is also waterproof. The demand for acrylic adhesive is presumed to remain high in the years to come. The global adhesives market is studied on the basis of key geographies, Middle East Africa, Latin America, Asia Pacific, Europe and North America. Due to the speedy adoption of new advancements in developing nations of Asia Pacific like Japan, China, and India, the demand for construction and infrastructure market is high on rise. This in turn propels adhesive market to be growing significantly. Asia Pacific contributes around 30% of the total share in the market and is predicted to continue doing so in the years to come. Some of the Major players in the global adhesive market are Pidilite Industries Limited, Henkel AG & Company KGaA, and 3M Company. These players are strictly focused on inventing new products for consumers. They may also merge with other companies to produce better end results for the consumers and overall more profit for the market. Since the manufacturing of eco-friendly products is also important, players are anticipated to use bio-based adhesives as well. This report analyzes and forecasts the market for adhesive at the global and regional level. The market has been forecast based on revenue (US$ Mn) and volume (Kilo Tons) from 2017 to 2025. The study includes drivers and restraints of the global adhesive market. It also covers the impact of these drivers and restraints on demand for adhesive during the forecast period. The report also highlights opportunities in the adhesive market at the global and regional level. The report comprises a detailed value chain analysis, which provides a comprehensive view of the global adhesive market. Porter’s five forces model for the adhesive market has also been included to help understand the competitive landscape in the market. The study encompasses market attractiveness analysis, wherein end-users are benchmarked based on their market size, growth rate, and general attractiveness. 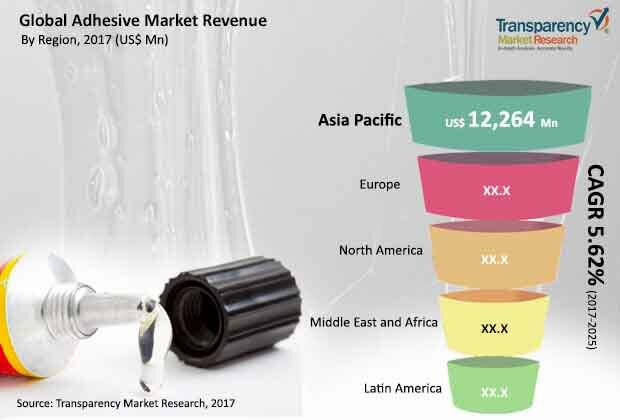 The study provides a decisive view of the global adhesive market by segmenting it in terms of type, product, and application. These segments have been analyzed based on present and future trends. Regional segmentation includes the current and forecast demand for adhesive in North America, Europe, Asia Pacific, Latin America, and Middle East & Africa. The report also covers demand for individual end-user segments in all the regions. The report provides the estimated market size of adhesive for 2016 and forecast for the next nine years. The global market size of adhesive has been provided in terms of revenue. Market numbers have been estimated based on key type, product, and application segments of adhesive market. Market size and forecast for each major type, product, and application have been provided in terms of global and regional markets. Secondary research sources that are typically referred to include, but are not limited to company websites, annual reports, financial reports, broker reports, investor presentations, and SEC filings, internal and external proprietary databases, and relevant patent and regulatory databases, national government documents, statistical databases, and market reports, news articles, press releases, and webcasts specific to companies operating in the market, National government documents, statistical databases, and market reports, India Brand Equity Foundation (IBEF), British Geological Survey, Adhesive and Sealant Council (ASC), The Federation of Indian Chambers of Commerce and Industry, Indian Polyurethane Association, The Adhesives and Sealants Association (TASA), Flexible Packaging Association, ABRE – Brazilian Packaging Association, World Packaging Organization, British Adhesives & Sealants Association, Society for Adhesion and Adhesives, and other. Primary research involves e-mail interactions, telephonic interviews, and face-to-face interviews for each market, category, segment, and sub-segment across geographies. We conduct primary interviews on an ongoing basis with industry participants and commentators in order to validate the data and analysis. Primary interviews provide firsthand information on market size, market trends, growth trends, competitive landscape, and outlook, etc. These help validate and strengthen secondary research findings. These also help develop the analysis team’s expertise and market understanding. The study includes profiles of major companies operating in the global adhesive market. Key players in the adhesive market include Pidilite Industries Limited, Henkel AG & Company KGaA, 3M Company, H.B Fuller India Adhesive Pvt. Ltd., BASF SE, The Dow Chemicals Company, and Bostik. Market players have been profiled in terms of attributes such as company overview, financial overview, business strategies, recent developments, and SWOT analysis.